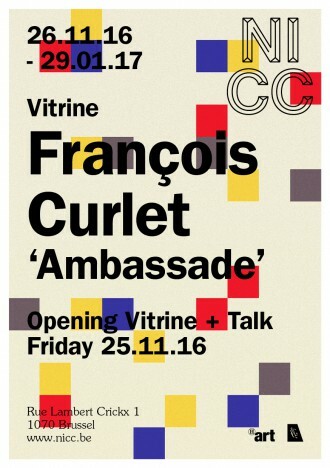 NICC is proud to present ‘Ambassade’, a new vitrine installation and talk by French artist François Curlet (1967, lives and works in Brussels). 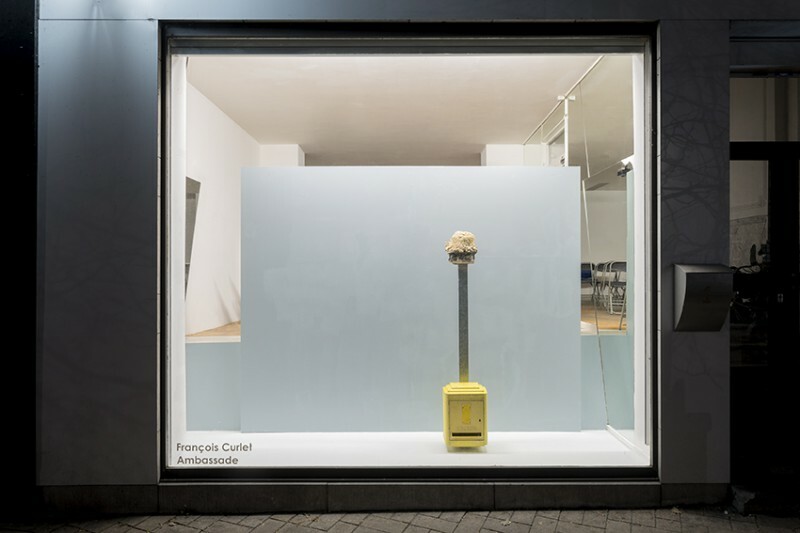 Like many of his works, ‘Ambassade’ starts from a slight and light-hearted yet subtle conceptual gesture, an idea that ‘generates the work of art’ but also has a more or less immediate visual effect. In the vitrine, Curlet will install a typically French letter box from the seventies and eighties upside down, transforming it into a sculptural readymade. The box itself will rest on the floor and serve as a pedestal. 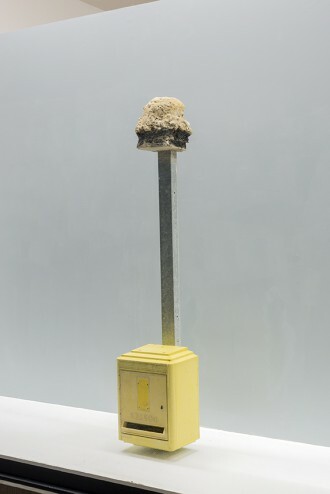 The pole on which it once rested now faces upwards, and holds a piece of the concrete from which the box was once torn (brutally, so it seems). Ripped from its original context and inverted, the work has a comically anarchistic quality. It does not only speak of its French origins, however, but also of the context in which it was placed. An poetic line that in itself reads as a paratactic line of poetry may offer some insight into some of the artist’s more particular intentions and associations, such as the recent influx of French fiscal expats in Brussels: ‘Upside Down, boumboum letter ball to xmas, frenchxit, taxfree, UHU stick the impossible: CocaPepsi’. the artist an chocolate ambassador of his own culture where once it is said Fluctuat nec mergitur in Paris? Whatever the answer to that question is, it is sure that ‘Ambassade’ is a pointy piece of dislocation questioning notions of location, territory and (false) identity.